It's July! And, Market Mommy is happy to announce what you've all been waiting for! The winner(s) of our First Birthday Extravaganza! First, I'd like to say thank you to everyone who entered, tweeted, blogged, facebooked, etc. about the contest! I appreciate your support! We had just under 300 entries! I've really enjoyed reading through them and getting to know you all a little bit better! And, we of course can't forget our awesome sponsors! Without them, this giveaway would not have been possible! Please review the list here and thank them whenever possible! 19. Michelle Miller at Kids Décor, Inc.
I’ve been using Squidoo for years, but early on, I didn’t see the potential in it and really did very little with it. These days, I know better and the site has become one of my main methods of promotion. One of my lenses that was built over two years ago and has barely been touched since, brings in over 100 visitors a week to my main blog. That might not be a lot, but it does add up! Why should you consider using Squidoo to promote your business? Well, there are a few great reasons, the first of which is that it is completely free . . . in fact you can actually earn money from them. For today’s purposes, however, we’re going to be looking at the promo value. Squidoo is also very well liked by Google, so pages or “lenses” as they are called, are ranked quickly and quite high. That means great backlinks, as well as more traffic. Squidoo lenses are excellent sources of high quality traffic . . . people come across them while looking for information and click through the links to your business website. Signing up for Squidoo is very simple. You’ll be prompted to set up your first lens immediately. Make sure to use top keywords in your title and URL and to select the “Do my own thing” option when setting it up. This will send you to a lens that has just an intro box or module. To set up your lens, you can add modules, of which there are hundreds. Don’t get too fancy though! Just an intro module, a couple of text modules and a guestbook are fine for your first lens. You can tweak later. Fill in the intro module first. This should just be an introduction to your business or the topic you’re writing about. Keep it short, about 100-150 words and keep in mind that the first couple of sentences are what will appear in search engines. Write two short articles, about 200 words long, using your keyword. This is actually something that can be easily outsourced. Add these to your text modules and include a photo. You can use HTML within the text to create links to your site. If you aren’t sure how to do this, the code is easily found online. You can also link your photos to a site, which is an excellent method of boosting traffic. Now, you can publish your lens and you have gone public. Once your lens is out there, it can take up to a week or so to get ranked on Google. You can speed things up by creating some publicity around the lens. Now that you’re a lensmaster, for example, you can go visit other lenses and leave notes. When you leave a comment, your username is automatically linked to your lensmaster profile. Anyone can click through and find your lenses, so make sure your comments are eye catching and interesting enough to entice someone to click. You should also start building more lenses! Link them to each other using the Featured Lenses module and build yourself a nice network of mini sites which will all help bring in traffic to your main business site. Just a warning though . . . Squidoo is addictive. Once you start building lenses, you’ll probably find that you can’t stop! Genesis Davies is a freelance writer and work at home mom of two. She blogs about Squidoo and everything else related to having a home business at At Home Mom Blog. I recently came across this quote from Oprah and it has become one of my favorites - "Breathe. Let go. And remind yourself that this very moment is the only one you know you have for sure." In early 2008, a year after launching Ficklets, I experienced a life changing, tragic event. My older sister and mentor, battling cancer at the time, came to live with me while she underwent a second round of chemotherapy. Unmarried with no children, she relied heavily on siblings to help care for her. I soon discovered after a couple weeks that caring for her required around the clock care. To do this I decided to take hiatus from building the business to devote all my time and energy on her. The next several months became the most challenging and difficult times in my life, and put me on a path of spiritual journey and self-discovery. Unfortunately, my sister lost her battle with cancer several months later. I was devastated, felt the deepest sadness and was immensely discouraged and unmotivated about business. Having lost the momentum, I questioned if I could continue building Ficklets. With much surprise, just when I thought I was letting go of the dream, we received a couple of online orders and an uplifting email from a potential customer expressing excitement at her discovery of Ficklets. This was enough to reignite the dream, enthusiasm and belief to forge ahead with Ficklets. Since then I have become an avid “inspirational seeker” and have made it a ritual to read positive, life affirming writings, surround myself with uplifting people and learn from heart-centered entrepreneurs. I dedicate this post to my sister Annie, my first female role model and mentor. She was intelligent, generous, kind and a girly-girl at heart (she loved high heels and large dangle earrings). She instilled in me I was beautiful and can do anything. I miss her desperately, but grateful, honored and humbled she asked me to care for her on her last days here on earth. The journey taught me so much, but the life lesson that lives strong in my heart and mind – support, serve and love. Ros Guerrero is the founder and inventor of Ficklets, eyewear charm huggers. If someone told you your kids could get their knowledge from the gutters, would you believe it? If you’ve ever wondered how to spark more excitement for reading in your children, then rain gutters may be just what you’re looking for. As a Homeschool mom of six, one of my greatest desires is that my children develop a love for reading. I could spend all my free time getting lost in books. Our home is overflowing with books, and bookshelves are sprinkled throughout its rooms. But honestly, my boys would rather be hunting for critters, fishing, dirtbike riding, skateboarding, building and constructing, or doing just about anything other than sitting still. Our daughter loves books, but is still too young to read on her own. One of the best additions we made to our home this year is using rain gutters as book displays. They allow us to display the books so that the covers are facing us instead of being stuffed tightly together on the shelves. The books look like they’re just begging to be read and the kids are drawn to them like magnets! We are blessed to have a spacious basement and were able to run the gutters the full length of the wall in our Homeschool room. You don’t need a lot of wall space to do this though, and the materials are very inexpensive. They can be purchased at any Lowe’s, Home Depot or other home improvement store and only require a few brackets and screws to hang them. Even a one foot section near a cozy chair in your child’s room could do wonders. I’ve found this to be a great way to increase literacy. The possibilities are endless. Let me know if you decide to use these. I’d love to see your finished project. Lisa Wible is a Homeschool mom of 10 years, residing on an old country road in DE with her husband, Michael, and their 6 wonderful blessings, Noah 15, Jacob 13, Josiah 11, Joshua 10, Seth 8, & Emily 2 ¾. She is also a Dental Hygienist with a B.S. in microbiology and immunology, but retired from her lucrative career just before her 1st baby was born and branched into the fields of midwifery & homeopathy. She continued pursuing her passion for holistic wellness by conducting Wellness Seminars for many years. She was also blessed with five of her own wonderful homebirths, three of them being completely planned unassisted waterbirths. As an entrepreneur, she has successfully worked from home in the relationship marketing industry for the past 12 years. When people ask her what she does she tells them she gets to stay home and raise her future leaders, and give out joy and blessings everyday! Through her business, Bless Others With Cards, she helps busy business executives and professionals leverage communication strategies that enable them to build deeper, more effective relationships to stay top of mind with their clients and customers and increase referrals. She loves helping other moms work from home and efficiently stay in touch with family, friends, and colleagues too. Visit Lisa at Lisa Wible.com or her family blog, Raising Future Leaders. Keeping your child occupied in the kitchen! While you are trying to pull together a meal for your family at the end of a long day, do you have young child or children clinging to your leg? Is that child or children chanting, “Eat time! Eat time!” I have such a child at my house. A solution I have found that keeps my two year old JDaniel entertained is to give him his own cooking project. He is given a plastic tub or stew pot with about two inches of water with a dash of liquid dish soap. When he starts stirring, whisking, and cooking in the water bubbles form and that is fun the fun really starts to boil. 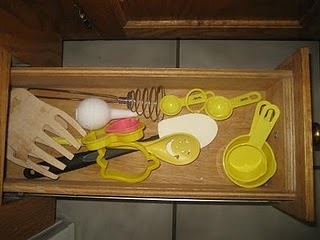 JDaniel has a drawer in the kitchen where I keep his cooking tools. He is able to help himself to the tools he would like to cook with each night. I have displayed JDaniel’s tool drawer below. You could use whatever you like. His drawer has some cookie cutters, a spoon, measuring cups and spoons, a nose aspirator (It makes great bubbles. ), a whisk, and salad claws. 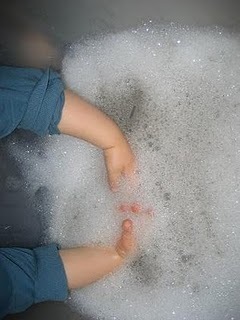 This activity is also a great way to have your child clean their hands. We pull out this activity out after we paint. It cleans the paint right off. Deirdre Smith is JDaniel4's Mom, the forty five year old mom of a two year old son named Joseph Daniel the fourth. After teaching for twenty years, she met and married Joseph Daniel the third and moved from Northern Virginia to a suburb of Greenville, South Carolina. Last summer she decide to take what had been a blog that would have an few chatty posts about learning to be a mom posted on it every now and see what would happen with more time and focus.